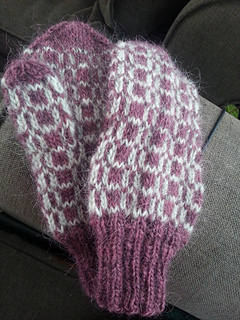 Hlekkir is a pattern for winter mittens. The name is in Icelandic and means “links on a chain”. Large - for a large man´s hand. The mittens are knitted from the bottom up, from worsted yarn with a tight gauge. Any yarn that gives the correct gauge can be substituted, but the mitten is very snug and warm knitted with worsted yarn at the suggested gauge. In the smallest size, one skein of most of the suggested yarns is enough for this gauge. In the larger sizes you will need just over one skein. Alternatively you could knit striped ribbing, or the single color decrease in the CC. You need much less than 1 skein of the CC.